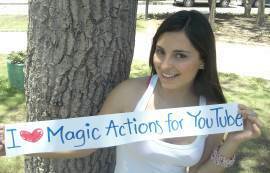 Magic Actions for YouTube™ is a light weight but powerful, safe and free browser extension that will turn your computer into a Home Theater for YouTube™. This extension is built for everyone who loves YouTube and watching videos. It is used by millions of home users and businesses, and it was rated five stars by more than 100k reviewers—the highest in the Chrome Web Store. If you're not using this extension yet, you've got to try it! Magic Actions for YouTube™ will help you create engaging multimedia experiences instantly, while playing any video that is available on YouTube. You can boost your productivity and make exceptional video presentations. You could even use it at a party, thanks to the vinyl mode! 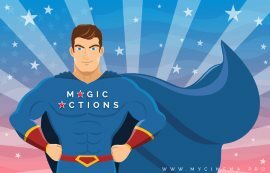 Magic Actions is easy to configure and use. It has a wealth of unique and useful features. We are the first to design and implement such features as "dynamic lighting effects around the player," "instant volume control with mouse wheel," "day and night viewing modes" and others. And that's not the whole list! You can find out about all of the features here. Also, we'd like to make a special mention about security and privacy recommendations, because privacy and safety are our top priorities! How To Install Chrome Extensions Manually? If, for some reason, you can't install Magic Actions from the Chrome Web Store, you can download it here and install manually. To do this, please follow the steps below. 1. Download the MagicActions_Latest.crx file by clicking on the Download button below. Chrome will warn you with the prompt "Extension, apps and themes can harm your computer. Are you sure you want to continue?" Just click on the Continue button, and ignore the alert message "Apps, extensions, and user scripts cannot be added from this website." 2. Open a new tab, and go to the chrome://extensions page. Enable the Developer mode at the top of the page by clicking the slider. After installation, you can disable the Developer mode. 3. Drag and drop the downloaded CRX file on the chrome://extensions page. Chrome will again warn you with the prompt "Extension, apps and themes can harm your computer. Are you sure you want to continue?". Just click on the Continue button. 4. That's all. Thank you for Reading and Downloading - You're Awesome! How Do I Manually Install Opera Add-Ons? If you can't install Magic Actions from the Opera Add-Ons gallery, you can download it here and install manually. To do this, please follow the steps below. 1. Download the MagicActions_Opera_Latest.zip file by clicking on the Download for Opera button below. After the download completes, unpack the zip archive to any convenient folder. 2. Open a new tab, and go to the chrome://extensions page. 3. Drag and drop the unzipped MagicActions_Opera_Latest.nex file on the chrome://extensions page. Opera will warn you with the prompt "Do you confirm the installation?" . Just click on the "Yes, install" button. 4. That's all. Thank you for Downloading and Installing - You're Awesome! Millions of people like you trust and use Magic Actions daily. If you have not already added Magic Actions to your web browser, now is the time to do it. There is no spyware and malware, and it is 100% free for everyone! Please note: extensions in a store are fully controlled by big companies, so an extension may be unavailable due to factors beyond our control. Do you have related questions, concerns or suggestions? Just drop us a message ✉. Softpedia guarantees that Magic Actions for YouTube™ for Chrome is 100% Clean, which means it does not contain any form of malware, including but not limited to: spyware, viruses, trojans and backdoors. Lighting Effects Around The Player. Control Volume Sound With Mouse Wheel. Watch Videos In Ultra HD Quality. Day and Night Viewing Modes. Take Snapshots From a Video.